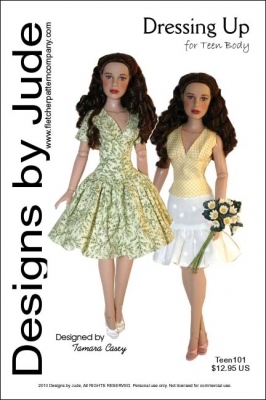 Up for consideration is Dressing Up, a clothing pattern to fit 15 1/2" Teen Dolls like Bella, Dorothy and Janet Lenon dolls. The pattern includes a knee length short sleeve dress with a gathered bodice, a sleeveless top with a gathered bodice and a slim fitting skirt with ruffled edge. Pattern has been designed to use with cotton, cottonblends, satin, silk or similar weight fabric. This design is also available for Tyler, Hermione and Ellowyne dolls.